Bomanite Florspartic 100 provides excellent impact, abrasion, and chemical resistance characteristics, with flexible properties. 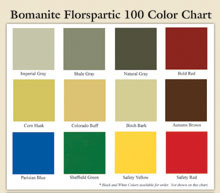 Suitable for high traffic interior or exterior applications, the material is ideal for clear topcoat sealer applications over decorative concrete, walkways, commercial applications, industrial facilities, swimming pool decks and garage floors With zero VOC’s, Bomanite Florspartic 100 has been formulated to be utilized at 100% solids or optionally reduced with green solvents for environmentally sensitive projects. 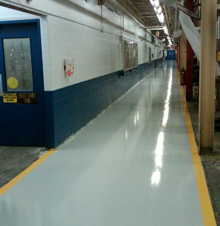 Bomanite Florspartic 100 can be utilized for USDA applications, tolerate incidental heat contact to 300 degrees Fahrenheit and is compatible with Bomanite Surtrac anti-slip additive for improved co-efficient of friction.